Four outstanding physicians will be honored for their distinguished work in medicine by their alma mater during the 68th annual Medicine Alumni Weekend at the IU School of Medicine. This year's event May 15 and 16 will highlight reunions for the classes of 1947, 1950, 1955, 1960, 1965, 1970 and 1990. At the Strawberry Shortcake Luncheon Saturday, alumni will be recognized for their contributions to the field of medicine. Distinguished Alumni Awards will be presented to Charles M. Clark Jr., M.D., and Charles J. Dietzen, M.D. Dr. Clark received his bachelor's degree from IU in 1960 and his doctor of medicine in 1963. A professor emeritus of medicine at IUSM, Dr. Clark joined the IU faculty in 1969 and was active in diabetes research and clinical care. In 1977, he established the NIH-funded IU Diabetes Research and Training Center, which was funded for the next 25 years and was the hub for hundreds of publications, scores of research grants and an incubator for talented investigators. Among his many services to the university, Dr. Clark served as associate dean for continuing medical education. In 1996, he was asked to design and chair the newly created National Diabetes Education Program, whose job it was to disseminate the results of the Diabetes Control and Complication Trial to patients and integrate them into clinical care. That experience motivated him to work in developing countries to improve diabetes care, including the recent development of two diabetes centers in China. A member of the IUSM class of 1987, Dr. Dietzen is the founder of Timmy Global Health, a non-profit organization with 45 chapters on college and high school campuses that allow students to help expand access to health care via fundraising service and advocacy projects. Last year, the organization helped more than 70,000 patients receive treatment in 59 low-income communities in five countries and sent more than 130 medical teams abroad. In addition, Dr. Dietzen is the co-founder and chief medical officer of iSALUS Healthcare; medical director for in-patient rehabilitation at Riley Hospital for Children at IU Health; serves as the medical director for Easter Seals Crossroads in Indianapolis and for CHAMP Camp; and is a consultant at Bradford Woods in Martinsville and for St. Francis Healthcare System. The Glenn W. Irwin Jr., M.D., Distinguished Faculty Award will be presented to Lindley H. Wagner, M.D., an IUSM alumnus from the Class of 1959 who also has a Bachelor of Arts degree from IU. 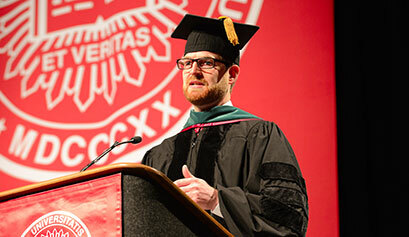 Dr. Wagner spent 30 years teaching and directing IU medical students on the Lafayette campus. His role in the late 1960s in medical education, the root of what is now a nine-campus system stretching across the state, began with three students at what was then dubbed the Lafayette Center for Medical Education. Three years later, Dr. Wagner, a Marion native, was named assistant dean of education and the director of what is now the Indiana University School of Medicine-Lafayette -- positions he would hold until his retirement in 1998. Dr. Wagner was heavily involved in continuing medical education, including the 1972 founding of the Lafayette Medical Education Foundation, which he led for 25 years. For 28 years, until 1997, he acted as director of medical education at Lafayette Home Hospital and St. Elizabeth Medical Center, providing more than 4,800 hours of education to area physicians. From 1963 until 1974, he also oversaw his own private practice. The Early Career Achievement Award will be presented to 2005 IU School of Medicine alumna Leslie A. Hulvershorn, M.D., who also has a bachelor's degree in neuroscience from IU. An Indianapolis native, Dr. Hulvershorn is an assistant professor of psychiatry and joined the faculty in 2010. Her area of specialization is brain imaging for children and adolescents at risk for substance-use disorders. Dr. Hulvershorn has been the primary investigator on seven active grants, including one funded by the National Institutes of Drug Abuse. She already has been the lead author on more than 20 peer-reviewed publications, written five book chapters and published 15 abstracts. Aug. 6, 20 and 27. As a reminder, news items for InScope should be submitted to scopemed@iupui.edu. Submission guidelines for InScope are available online. Information and announcements for the MedTV closed-circuit TV system should be submitted at least a week in advance of event date to medtv@iupui.edu. Submission guidelines for MedTV are available online. The IU Simon Cancer Center’s Cancer Research Day will be from 8 a.m. to 3:30 p.m. May 21 at the IUPUI Campus Center. The symposium is scheduled from 8 to 10 a.m., followed by poster and abstract presentations. Nancy Davidson, M.D., will present the keynote address, “Tackling Hormone Resistance in Breast Cancer,” at 1:30 p.m. Dr. Davidson is director of the University of Pittsburgh Cancer Institute, associate vice chancellor for research, and professor of medicine at the University of Pittsburgh. The event will conclude with an awards presentation at 2:30 p.m.
Cancer Research Day is an annual event aiming to increase understanding and awareness of IU Simon Cancer Center research endeavors and encourage collaboration with other cancer research institutions in Indiana. Parking permit rates for the 2015-16 academic year are now available. Current annual employee permits expire June 30. Employee permits for 2015-16 go on sale June 1. A list of parking rates and details on a new permit option are included on the Parking Services website. The Walking for Dreams 5K, supporting the IU Student Outreach Clinic, will be May 17 on the canal in downtown Indianapolis. Registration is at 1 p.m. and the walk/run begins at 2 p.m. All participant and contributor pledges go to support the clinic, which provides free health care services to the underserved population on Indianapolis' near-east side. Walkers/runners are asked to pledge at least $25 to participate. Register for the Walking for Dreams 5K by completing the Google form. Students from 10 Indiana middle and high schools gathered at the IU Health Neuroscience Center April 25 for the first Brain and Beyond Fair meant to stimulate interest in the broad range of disciplines that encompass the neurosciences. 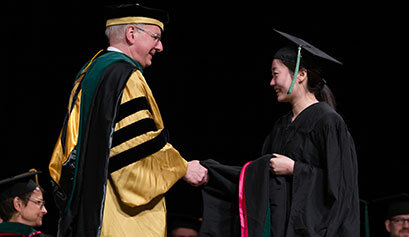 The program was initiated by Nicholas Barbaro, M.D., chair of the department of neurological surgery, and his wife Sue Ellen, to let young people know that neuroscience encompasses a broad range of disciplines and creative activities -- not just brain surgery. In addition to presentations at career booths and tours of the neuroscience center, the day's activities included a science fair with students' neuroscience-related projects. Older Indiana adults with dementia or depression will be among the best cared for elders in the nation beginning this month with the statewide roll-out of a unique automated decision-support system that enables their care coordinators to meet the complex bio-psychosocial needs of these individuals as well as those of their family members and other informal caregivers. Use of the Enhanced Electronic Medical Record Aging Brain Care Software, developed and tested by the IU Center for Aging Research and the Regenstrief Institute, is being implemented throughout the state by Indiana's 16 Area Agencies on Aging. Area Agencies on Aging, of which there are 650 nationwide, oversee state and federal funds and private donations to provide information, advocacy and support services to older adults and family members. "The number of older adults nationally and in Indiana is growing rapidly. Delivering personalized care to this population is difficult and requires the ability to track a sizeable number of mental and physical indicators," said geriatrician Malaz Boustani, M.D., MPH, associate director of the IU Center for Aging Research, Regenstrief Institute investigator and the Richard M. Fairbanks Professor in Aging Research at IUSM. "The software we have developed will help the care coordinators based at Indiana Area Agencies on Aging, who have the expertise and resources needed to measure and meet the many bio-psychosocial needs of these patients and their loved ones and monitor the effectiveness of individualized care plans." The Faculty Steering Committee has announced this year’s election results. Faculty elected will serve from July 2015 to June 2017. President-elect: Emily C. Walvoord, M.D. IU Health Physicians representative on the Faculty Steering Committee: Emily C. Webber, M.D. Regional campus representative on the Faculty Steering Committee: Margaret A. Schwarz, M.D. IUPUI Faculty Council: Joseph R. Dynlacht, Ph.D.; Lindsey D. Mayo, Ph.D.; Li Shen, Ph.D.; Jodi L. Smith, M.D., Ph.D.
CFAS representative: Nicole D. Horn, M.D. Academic standards: Christine R. Stehman, M.D. ; and Andrea L. Pfeifle, Ed.D. Awards: Susan K. London, B.S., MLS; and Fletcher A. White, Ph.D.
Biomedical research: Tamara S. Hannon, M.D. ; and Uma Sankhar, Ph.D.
Community relations: Kamnesh R. Pradhan, M.D. ; and Bree A. Weaver, M.D. Curriculum council: Michelle K. Zimmerman, M.D. ; and Tracy C. Vargo-Gogola, Ph.D. Faculty promotion and tenure: Linda A. DiMeglio, M.D. ; and David W. Boyle, M.D. Lecturers and clinical rank faculty appointment contract and promotion: John S. Fuqua, M.D. ; and Mark H. Hoyer, M.D. Student promotions: Amanda D. Benaderet, M.D. ; and Steven P. Gerke, M.D. Alpha Omega Alpha Honor Medical Society Awardees: Ashish Arshanapalli, Megan G. Baker, Manickavelu Balasubramanian, Scott W. Barton, Cody R. Bearden, Robert S. Bednarek, Sophia I. Binz, Alyssa J. Bolduan, Chelsey Caldwell, Jacob M. Capito, Han T. Cun, Rachel E. Eldert, Anthony R. Ferrantella, Kevin J. Flynn, Ishan Gohil, Kathryn E. Hodgdon, Brandon S. Huggins, Ryan M. Kammeyer, Michelle L. Kerr, Erin E. Ketchem, Alexander L. Kuzma, Christopher J. Lehmann, Brandon G. Lucas, Rachel J. Macias, Jordan C. Maryfield, Logan R. McNeive, Adam R. Miller, Kenneth A. Moore, Elizabeth Nafziger, Ryan A. Nixon, Jonathan M. Parish, Joshua S. Park, Sarah H. Parrish, Elizabeth A. Peacock, Steven D. Rhodes, Alexander L. Schneider, Katherine E. Seat, Laura B. Secor, Jennifer R. Sondhi, Scott J. Speelziek, Annette N. Sullivan, Hunter J. Underwood, Ethan D. Valinetz, Jenny Wang, Scott M. Wentz, Mallory Williams, Christopher A. Wrobel, David Y. Yang and Ryan W. Zipper. Gold Humanism Honor Society Awardees: Samantha A. Armstrong, Velu Balasubramanian, Chelsie L. Baughman, Alyssa J. Bouduan, Angela M. Budgin, Jacob M. Capito, Aisha N. Davis, Samantha J. Deans, Danyal M. Fer, Kristin N. Geros-Willfond, Charles B. Goodwin, Christopher Green, Kathryn E. Hodgdon, Mark J. Hood, Kathleen M. Kelley, Christopher J. Lamb, Michael J. Maurer, Carissa J. May, Derryl J. Miller, Elizabeth Nafziger, Kate E. O'Connor, Jonathan M. Parish, Sarah H. Parrish, Carolyn Payne, Darren Plummer, Alexander L. Schneider, Jared R. Shields, Scott J. Speelziek, Elizabeth P. Darnell, Annette N. Sullivan, Jason W. White, Mallory Williams and David Y. Yang. How much does your health matter to you? Full-time employees spend more than a third of their waking lives at work. Complete the 2015 Workplace Health & Wellness Survey to help guide changes that improve workplace support for employee health and wellness at Indiana University. Deadline to complete the health and wellness survey is May 18. Applications are sought for the Graduate Student Imaging Research Fellowship coordinated through the Imaging Research Initiative of the IUPUI Office of the Vice Chancellor for Research. The objective of this two-year program is to provide a stable source of funding for graduate students pursuing a doctoral degree who are primarily focused on research in imaging technology development. The program seeks to establish interdisciplinary imaging research activities that aid in the development and implementation of innovative imaging methods and imaging-related technologies. Complete description of the GSIRF program and application guidelines are available. Applications are due 5 p.m. June 15. Contact Etta Ward at emward@iupui.edu or 317-278-8427 with questions. The IU School of Medicine is seeking qualified candidates to fill the newly created position of executive director of the Indiana Center for Musculoskeletal Health. The center will be an international leader in basic and translational musculoskeletal disease research, clinical treatment and education, poised to develop solutions for patients suffering from musculoskeletal disorders. IUSM desires a candidate who is a "builder" interested in pioneering cross-disciplinary and cross-institutional approaches to science in collaboration with statewide partners in industry. More details about the position, including a full job description, are available. Names of qualified candidates may be sent to Liz Whitaker at whitakea@iu.edu. The Molecular Therapeutics Program, part of the Indiana Clinical and Translational Sciences Institute, seeks applications for a competitive program that will provide funds and essential consultation to support the early stage development of therapeutics. This opportunity is provided in concert with the newly established Indiana Drug Discovery Alliance, a clearinghouse for drug discovery and development resources at the Indiana-CTSI member institutions of Indiana University, Purdue University and the University of Notre Dame. Third-year medical student Amy Fuhs, IUSM-South Bend, is the recipient of a Fogarty Global Health Fellowship to support medical research in Lima, Peru, during the 2015-16 academic year. Fuhs’ research will focus on stroke rehabilitation. Patrick Davis, MSIII, IUSM-South Bend, is the recipient of a 2015 American Medical Association Foundation Leadership Award for his work co-founding the Navari Student Outreach Clinic in South Bend. Davis is one of 10 medical students in the nation to be recognized by the AMA for achievements in community service, medical education and public health. Tatiana Salazar, graduate student at the Glick Eye Institute, IUSM Department of Ophthalmology, and the Genetics Institute at the University of Florida, won the University of Florida's Big Idea Competition. Salazar earned $25,000 to start her business after graduation this fall. Her business, Stem Point, will provide a safer alternative for the isolation and preservation of stem cells of show, race and companion horses through a new and unique stem cell therapy. Her business idea began during a five-year research project led by Maria Grant M.D., Marilyn K. Glick Professor of Ophthalmology.